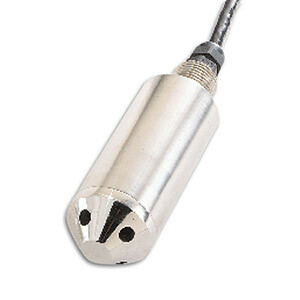 OMEGA’s PX78 Series transmitter is a submersible transducer suitable for liquid level and depth measurement. Its all stainless steel, hermetically sealed housing make it suitable for immersion in most industrial liquids and oils. A 3 m (10 ft) vented cable (longer lengths available) provides an atmospheric pressure reference. The PX78 is also available in metric configurations, with models from 0-270 mbar to 0-1 bar pressure ranges. Please see the PXM78 for complete details, or contact our Pressure department for more information..
注: OMEGA does not offer a warranty on this product, its use or application. It is the end user’s responsibility to assure proper installation and use of this transducer. The Standard cable length is 10 ft and optional lengths are available up to 300 ft.